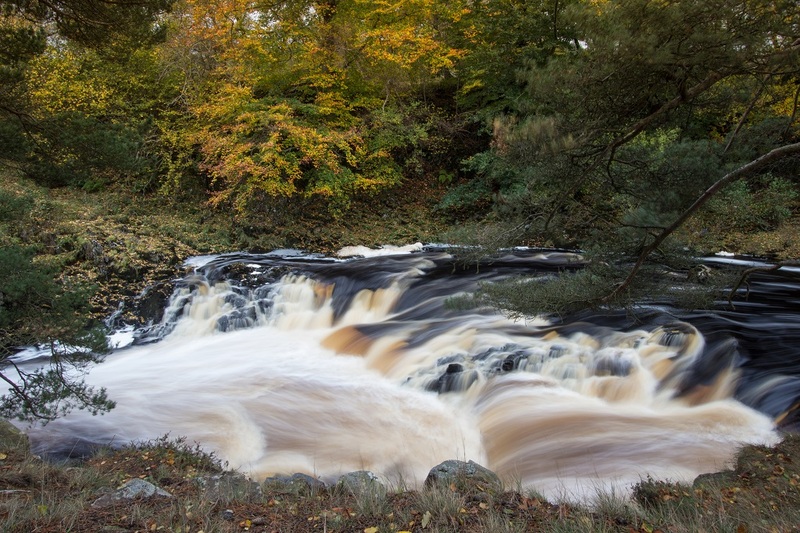 A midweek day off work gave me the chance to head out for some photography, Teesdale in the North Pennines is an area I hadn’t been to for a long time and with the autumn colours it seemed like a great time for a return. 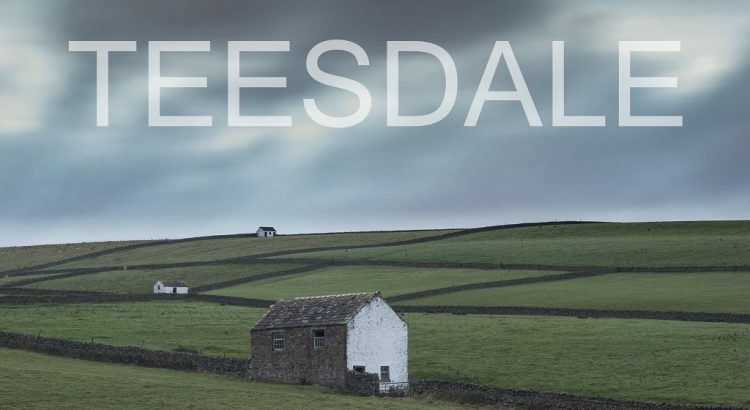 Teesdale is such a beautiful place, it is one of the largest Areas of Outstanding Natural Beauty in the country. It has acres of outdoor space, numerous grand waterfalls and miles of amazing walks. It is also a fairly quiet and peaceful place with reasonably low visitor numbers. It is often possible to have some locations entirely to yourself. The drive to Bowlees has some great views and pretty little villages on the way. 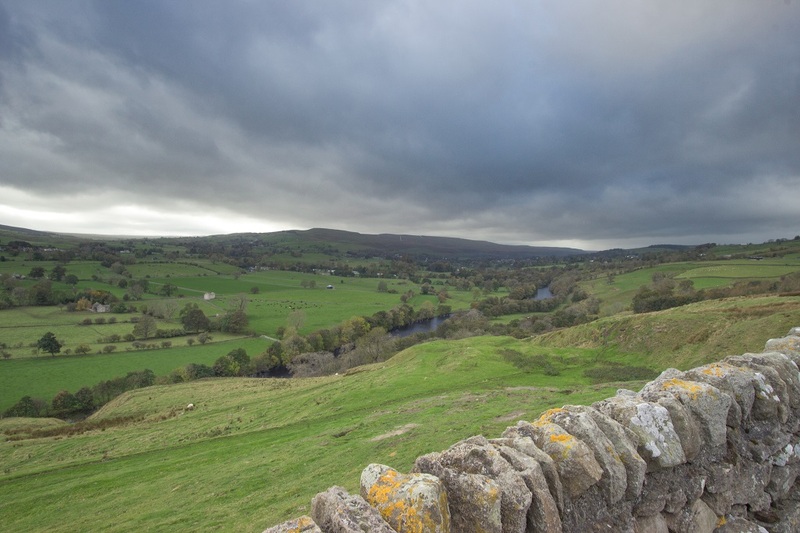 The view towards Middleton-in-Teesdale from the B6282. 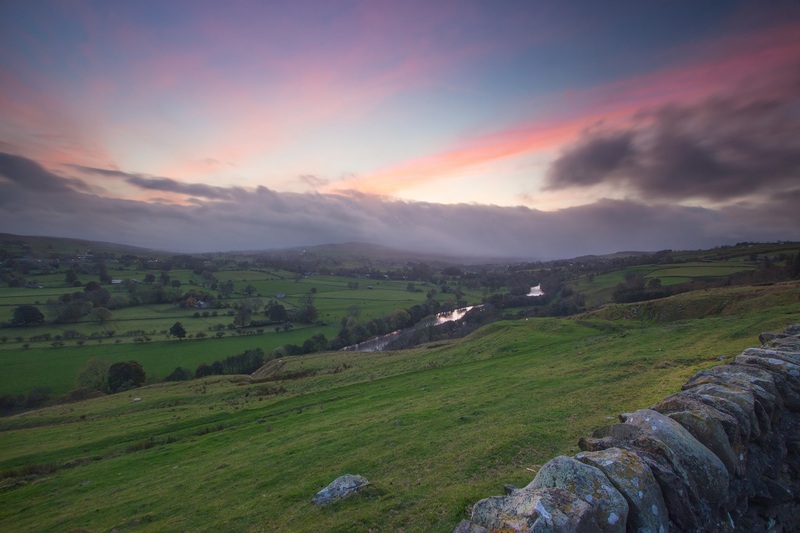 I hoped to capture the sunset from this location on the way home where it sets over the valley. Sat Nav postcode: DL12 0XF. Free parking 24/7. I headed to the area around the Bowlees Visitors Centre and parked for free in one of the gravel lay bys on the main road (B6277) just past the little hamlet of Bowlees. Across the road from the first lay by is a path that goes directly to Low Force, not more than five minutes walk from the road. Follow your ears for the roar of the water and you will not go far wrong. 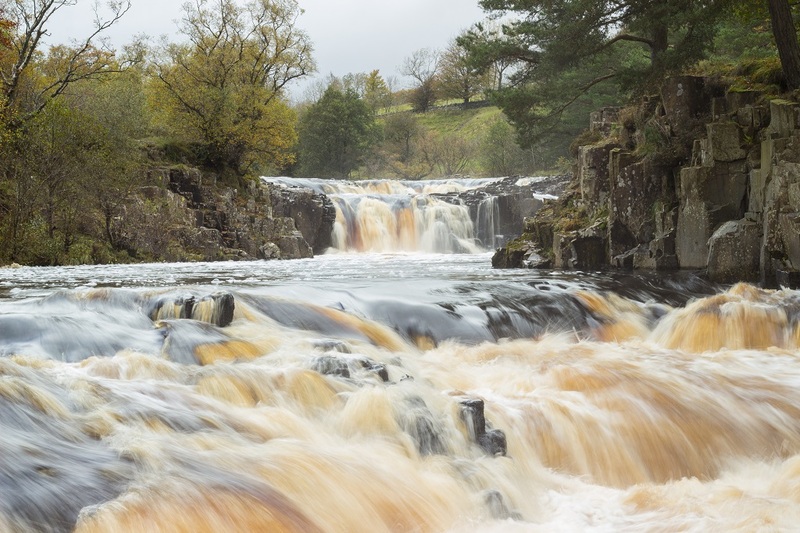 Low Force is a pretty set of falls tumbling off a number of ledges in the Whin Sill or Whinstone as it is known locally. There is an island in the river seen to the right in the picture below. The rocky outcrop gives the best view of the falls but it is only accessible carefully when the river level is low with wellies. 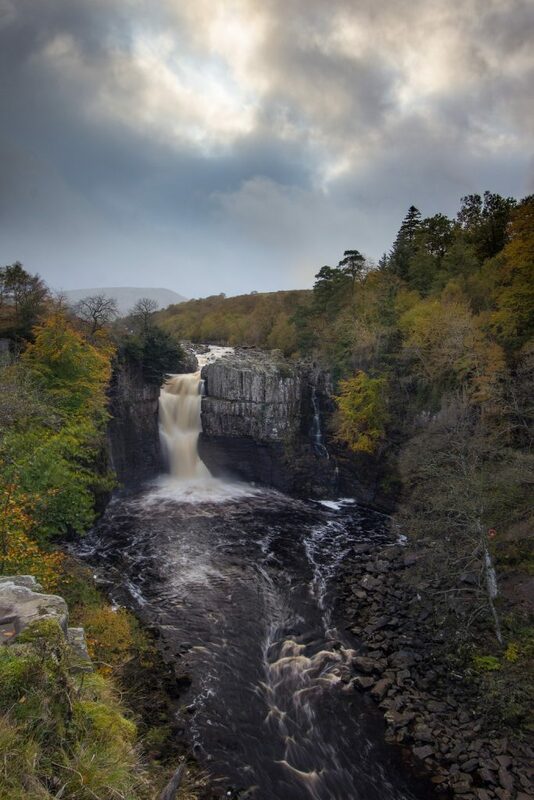 Autumn at Low Force Waterfall near to the Wynch Bridge. The bridge is the second such bridge at the location, it was built in 1830 to replace the original which was the first known suspension bridge in Europe. Sadly the original fell down when one of the cables snapped, dropping three local haymakers into the Tees. Low Force Waterfall, Teesdale from the South bank on the walk to High Force. 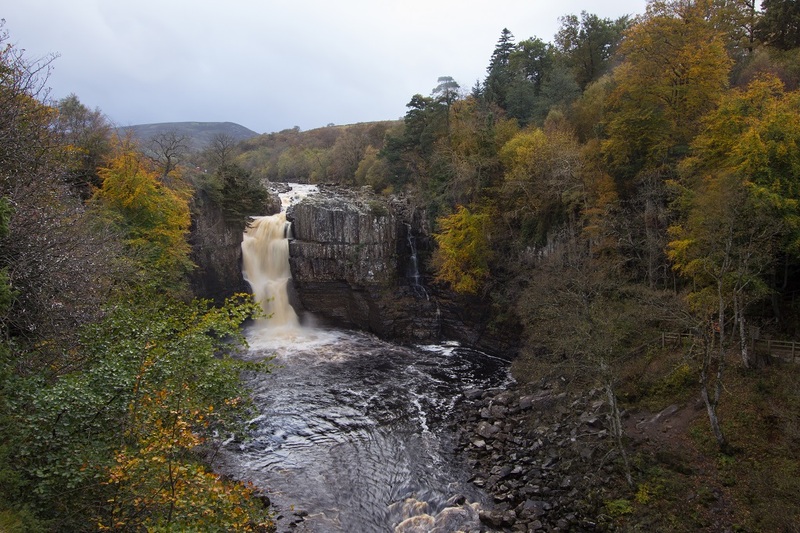 Autumnal views of High Force Waterfall in Teesdale. My favourite picture of the day, the light broke through the clouds just at the right time. It was still raining in the distance making the horizon misty. 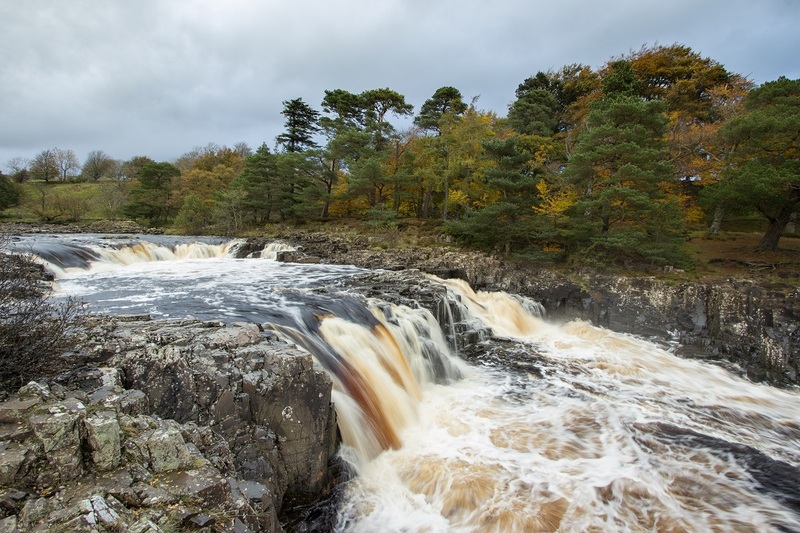 Given a full day it is possible to follow the path up river from High Force to Cauldron Snout, the area along the River Tees is stunningly beautiful with lots of scenery to take in. I headed back down the river to the car, before I left I spotted another shot from the roadside. 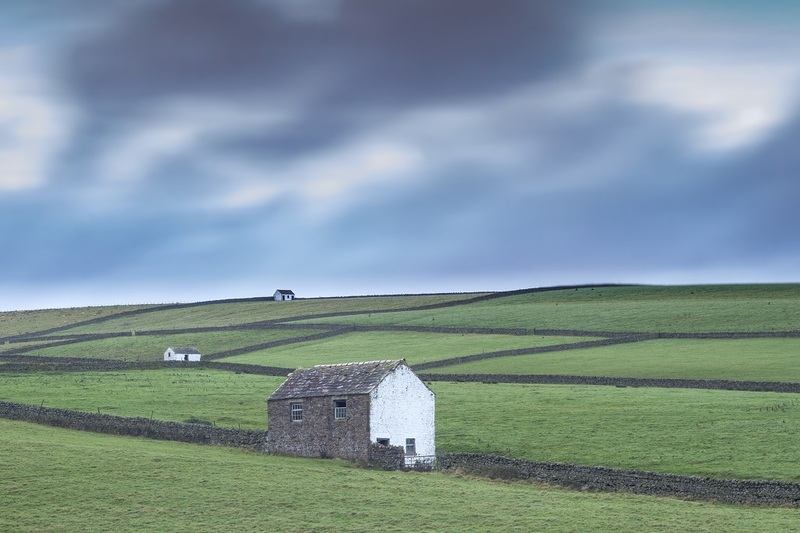 A typical view of Teesdale, barns and stone walls, the strong composition of zig-zagging leading lines was obvious from the road. Getting the right angle required a bit of fence and wall hopping. It was only once I had captured the shot that I realised the hurdle over the barbed wire wasn’t necessary, there was a nice gate not more than 25 metres down the road! Sure enough my return home coincided with the sunset at Middleton-in-Teesdale. Out of nowhere the misty drizzly skies cleared to a pink and blue hue. I pulled up in the lay by on the B6262 and captured the shot. The low cloud that I left behind still hugging the hill tops in the distance. Sunset over Middleton-in-Teesdale from the B6262. The area has so much to photograph that it’s likely to capture the attention over several visits. 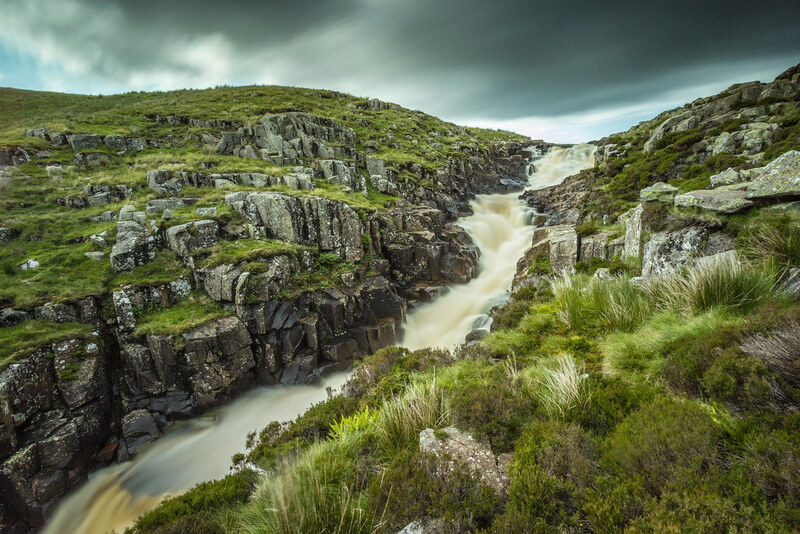 Bowlees visitor centre has a number of waterfalls with Summerhill Force and Gibson’s cave. Further up the river is Cauldron Snout, this can be walked inside a day from Low Force but it will take most of the day. It can also be reached by a drive up the road with parking at Cowgreen Reservoir. 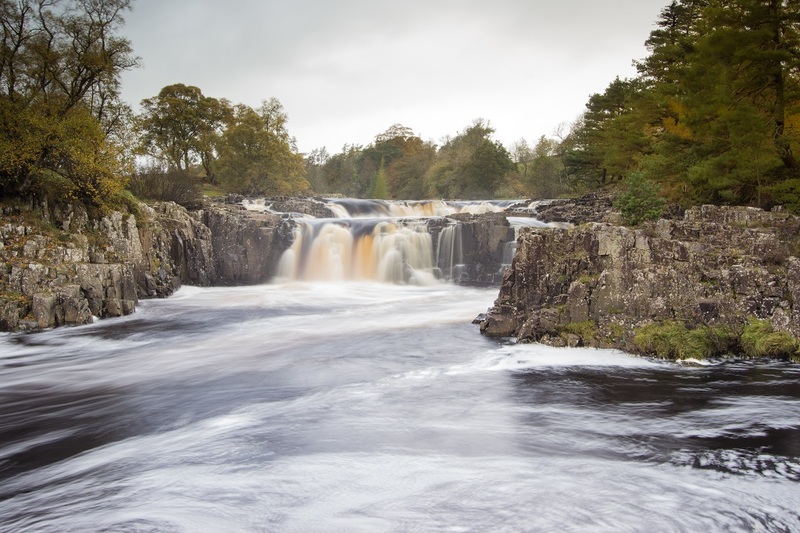 Cauldron Snout Waterfall, on the River Tees at Teesdale. The water tumbles down from Cowgreen Reservoir. This shot was captured in July 2015. If you enjoyed this post please hit subscribe at the top-right!